Choosing the right person to work with you on your nutrition goals can be overwhelming. Do you choose a nutrition coach, a nutritionist or a Registered Dietitian? Is there a difference? Yes, there is and here’s why it matters. It’s important to distinguish the difference between a Registered Dietitian, a Nutritionist, and a Nutrition Coach so that you can make an informed decision when choosing to work with someone who best meets your needs. All serve to help improve lifestyles through healthy habits like better nutrition, improved hydration, regular exercise, quality sleep, and stress management. 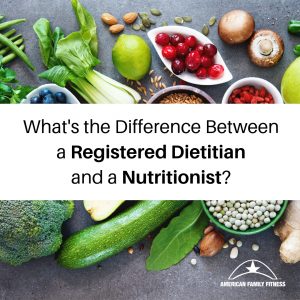 But what separates a Registered Dietitian from all the rest is that a Registered Dietitian has a degree in nutrition, has completed an accredited 1000+-hour internship, has passed a national board exam, and maintains a registration status through ongoing continuing education. Registered Dietitians provide nutrition recommendations based on evidence-based research and reputable peer-reviewed literature. They are skilled to assist not only with weight loss education and general nutrition needs but also with medical nutrition therapy. Medical nutrition therapy means they can provide nutrition solutions to medical conditions like cardiovascular disease, high cholesterol, diabetes, celiac disease, high blood pressure, low thyroid, etc. Working with someone who has the background, experience, and knowledge can be a major game changer! All nutrition services offered at American Family Fitness are provided by our team of expert Registered Dietitians, and we proudly offer nutrition services to our members at the best, most affordable prices in the area! Pam Speich is the Director of Nutrition Services at American Family Fitness and the Registered Dietitian at the Short Pump American Family Fitness location. She graduated from Carson Newman College with a Bachelor of Science Degree with Honors in Foods and Nutrition with an Emphasis in Dietetics. She completed her Dietetic Internship at Vanderbilt University Medical Center and earned the credentials Registered Dietitian in 2000. In March 2018, Pam became a certified personal trainer. 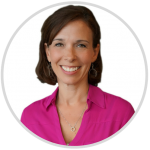 Pam’s experience includes nutrition counseling, wellness program development, public speaking, wellness research and writing, sales and marketing, and food labeling. Her areas of nutrition specialty include weight loss, heart healthy diets, diabetes, celiac disease, food allergies and intolerances, and low thyroid conditions. What Pam loves most about being a dietitian is the opportunity to witness lives changed for the better through the power of food. When Pam is not at the club, you are likely to find her at a sporting event with one or more of her three boys, traveling with her husband, or working on a home improvement project.